Look no further for the ultimate companion to your wine nights! Clean cork removal first time, and EVERY time! 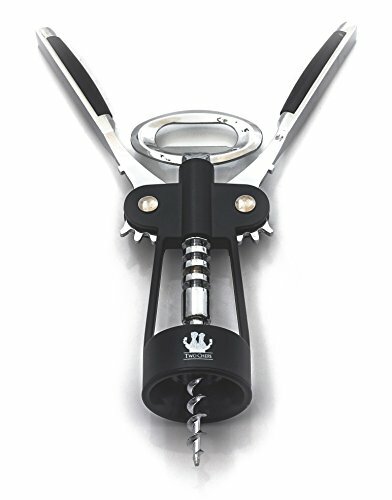 - Do you rely on poor quality corkscrews that chew up the cork more often then not? - Have you used a corkscrew where the lever arms are stiff and just seem to be more trouble then they're worth? - Do you find that time and time again you finally get the corkscrew started and you find that you're winding down the side of the bottle neck? - Do you want to share that special bottle with your special someone, when you're worried that you might break the cork? The Two Chefs Wine guarantee is to ensure that our customers receive nothing but the best. This product has been tried and tested and has withstood some rigourous testing, all without a blemish on its record. - Oversize screw top for ease of use. - Cyclic load analysis of the helix and arms puts the number of uses before deterioration at over 500,000! The partners here at Two Chefs are so confident you will love this wine opener so much, that your purchase comes with a 100% LIFETIME guarantee! If you have any questions, comments, complaints, or even if you simply just don't like it, the Two Chefs Guarantee states that your purchase can be replaced or refunded with no questions asked! Do you see a quality builder using poor quality tools? There's the right tool for the right job, and when it comes to wine, there's no quality like Two Chefs. Add to Cart Now! DESIGN - The sleek, modern design combines function and style, and looks right at home in designer kitchens, high end restaurants. You'll want this accessory lying on the bench when friends come over to enjoy that bottle you've had hidden. FUNCTIONALITY - Packed with features, the corkscrew wine opener offers three inch lever arms to facilitate effortless removal of even the most stubborn corks, a custom pitch angled helix has been designed to optimise speed, effort required and minimises damage to cork during use. The extended helix also means no pulling the cork out, the lever arms will take care of the whole job! Don't feel like wine? The oversize handle doubles as a bottle opener! ERGONOMIC AND USER FRIENDLY - The design not only looks great, but also offers subtle improvements to the standard product. Longer lever arms, soft touch handles, chamfered collar to ensure centering on the bottle, all contribute to a flawless experience when you next sit down to a good bottle. HIGH STRENGTH ALLOY - With all working parts constructed of durable high strength alloys, the Two Chefs Wine Opener is guaranteed to maintain its integrity, not for the life of the product, but for the life of you and your family. CUSTOMER SATISFACTION GUARANTEE - Since we only use the highest quality products, we have no problems guaranteeing all of the Two Chefs range. FOR LIFE. All our products are dishwasher proof, stain resistant, corrosion resistant, maintenance free, and guaranteed to last. If for any reason you are dissatisfied with your purchase our customer service team is there to address any of your concerns, and you as the customer are entitled to a replacement of refund if you are dissatisfied in any way. If you have any questions about this product by Two Chefs Kitchenware, contact us by completing and submitting the form below. If you are looking for a specif part number, please include it with your message.